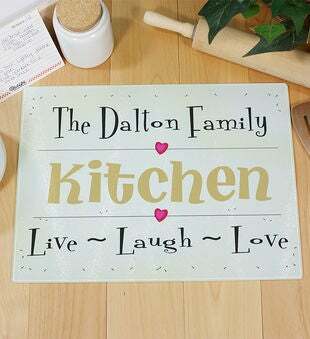 Add personality to seemingly ordinary kitchen accessories with a personalized Live Laugh Love Cutting Board. The Live Laugh Love Cutting Board features a custom design and is heat-resistant! All of our glass cutting boards feature tempered glass. Prepare your favorite meal on our glass cutting boards in a truly personal way. 30mm radius corners Measures 15 ¼” x 11 ¼”. This heat resistant glass cutting surface is dish washer safeArrives with self-adhesive rubber feet.